Holy hell, has it been a year all ready? That’s right – Plaid, the folks behind Brandflakes for Breakfast, are starting Plaid Nation in a mere ten days! In their venture, they managed to interview Robert Scoble, Cathy Brooks from Seesmic and Biz Stone (of his many involvements – Twitter being the one you probably know). Awesome People, Awesome Concept, Awesome Execution. 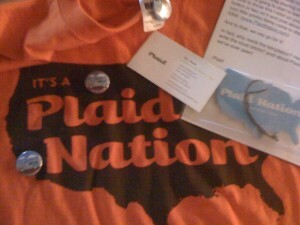 Cool schwag for Plaid Nation! If you haven’t gotten your fill of Plaid yet – they’ve got some new digital freebies up for this year, complete with theme song :) and a twitter stream to help the normals check in on the fun. So Darryl, you may be getting an email from me if I can pry myself away from work for a day or two and make my own road trip (without a live stream of the trip, but I can tweet away) to see how much of the Plaid fever I can catch. Keith – if you decide to make the journey to Indianapolis, keep an eye on the @plaid twitter stream for our whereabouts. Snack time and lunch times are good times for meet ups. Definitely give us a shout if you decide to make the drive! Hey Keith, thanks for the PlaidNation love! Now we need to do our part. Can you email me your contact info and t-shirt size so we can send you some sweet tour gear…much like the tour gear featured in the pic on your post, only cooler? Thanks! Keith, how do I get ahold of you? Couldn't find an email or contact form.